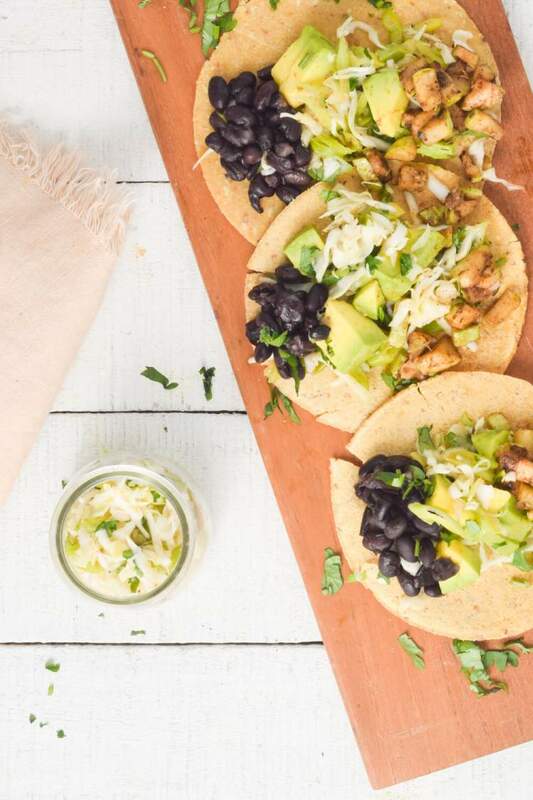 Black bean and zucchini tacos with the most amazing cilantro and avocado cabbage slaw are the perfect vegetarian tacos. Zucchini and black bean tacos the perfect way to get your family to try a meatless meal. No one misses the meat with these hearty tacos. Another Taco Night favorites – these Chicken Tostadas and Chipotle Shrimp Tacos. Lately, I have been consciously trying to eat more vegetables and add more greens to our diet. But, truth be told, it is usually a harder sell with my husband. Although I wouldn’t describe him as vegetable-averse, he sees them as more of a condiment than a main ingredient and is extremely skilled at eating his way around them. However, I’m happy to report that all changed when I started making vegetable-based tacos. When any variety of veggies are layered into a tortilla and then covered with salsa, he is happy to eat his fair share of vegetables and then some. We started with these Black Bean and Zucchini Tacos with Cilantro Avocado Slaw. The zucchini is covered in a spice blend featuring ancho chili powder, which is made from chipotle peppers. They are cooked until they begin to char and then paired with earthy black beans and then topped with a cool, crunchy slaw. It’s a perfect vegetarian meal that even meat eaters will love. 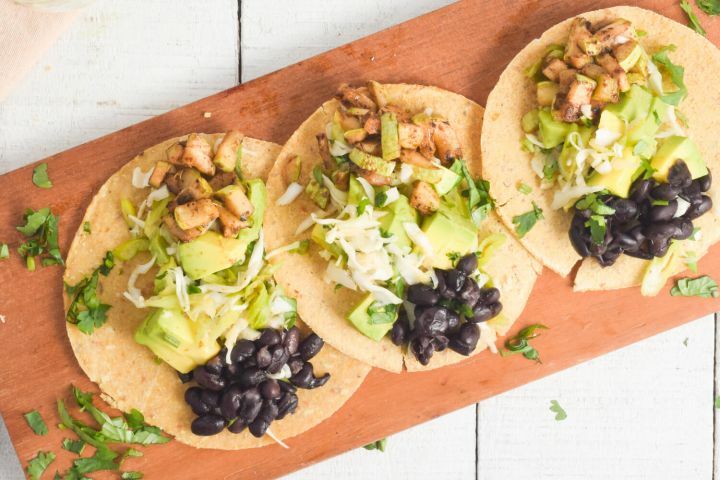 If you are looking for a nutritious meal that helps you “turn” picky eaters — whether your spouse or your kids — look no further than these vegetarian tacos. 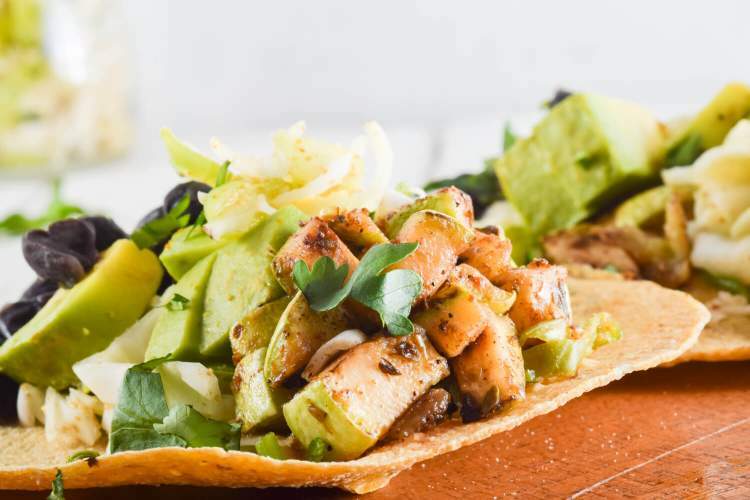 Easily customizable both in ingredients and in flavorings, you’ll be hard-pressed to find someone who is not pleased by these tacos. Tacos are crazy easy to customize! Trust me, as a taco aficionado, I know what I’m talking about. Make the tacos spicy by including jalapeno slices while you’re cooking or add them as a topping when you’re layering on your ingredients. Other ways to make your tacos spicy include incorporating chipotles in adobo, red pepper flakes, or a healthy dose of your favorite hot sauce. If you like to add sour cream to your tacos, consider using a low-fat variety or a dollop of Greek yogurt (you won’t even be able to tell the difference). Tacos are even better the next day. Any kind, any variety, any toppings. Don’t ask me why, I just devour them the next day (that is IF we have any leftovers to begin with). I usually just reheat the ingredients and top on a tortilla or a lettuce wrap, but you can also add these to a bed of lettuce for a mighty fine salad. Make individual salads or one big one to share as a dinner entree. I’ve used these leftover ingredients before for making a taco dip. Layer them in as you see fit, alternating with other layers of low-fat cream cheese mixed with taco seasoning, low-fat cheeses, salsa, and lettuce. Serve with homemade tortilla chips, veggie chips, or cut up veggies. Toss the ingredients with other leftovers like rice, chicken, potatoes, or even eggs. Let me know if there are any ideas I’ve missed — I always enjoy learning new ways to enjoy leftovers.